Christmas card making workshop tomorrow, followed by a trip to lovely Mount Barker on Thursday for the hand made craft market in the Town Hall from 10am to 3pm. Be early to see all the fantastic goodies that have been lovingly hand made and available for sale - including wood turning, paintings (oils and water colours), knitting, sewing, jewellery, home baked yummies, candles, soaps, and of course cards, tags, boxes, photo frames, scrap book pages and other great papercraft items!!! Stay for lunch or an early afternoon tea too. Here is a picture of some of the goodies I will have for sale at my stall at the Meadows Country Market tomorrow (Sunday 14th Oct). 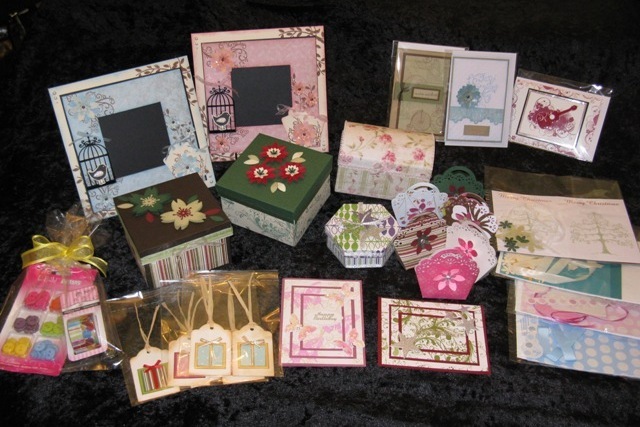 Photo frames, gift tags, decorated gift boxes, mini party purses, card making kits, and more! A great time was had by all last Thursday at the new Mount Barker Craft Market, and I am looking forward to the Meadows Country Market this Sunday. I hope to make up some DIY card packs and other Christmas gift ideas. Yes, Christmas pressies already! Wow - Kaszazz keeps us all on our toes with all sorts of surprises! This time it's a competition where consultants get entries to win an Ipad. If you've ever thought about joining as a consulant, now would be a really good time. Plus, there is the opportunity to win a ticket on a cruise in 2014 with Kaszazz directors, Peter and Karen Stock. Seriously, it's time to sign up and be eligible to win these AMAZING prizes! I have updated the "Something Special" tab with this months bonuses. And don't forget the flier for the new products released lives here, or send me a message and I will post you a copy. I had a great day crafting with some friends today, and will be finishing off some projects ready for the Mount Barker craft market this Thursday. Feel free to drop into the Mount Barker Town Hall between 10am and 3pm, and say Hello!